I am not much with pie doughs, rolled cookies or anything that requires the right balance of flour to make it not too dry but just dry enough to roll. My doughs always wind up being too sticky or dry and then I lose patience. 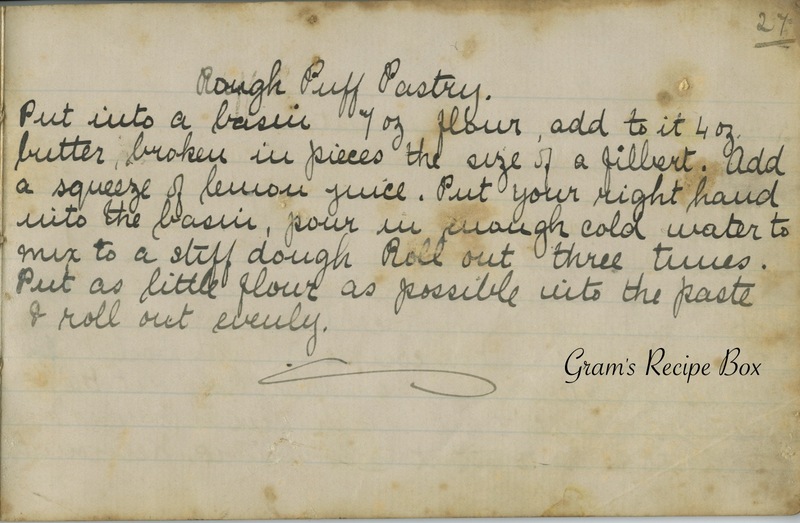 There are many puff pastry recipes out there, all of them more detailed than Maggie’s recipe pictured above. If you have never made puff pastry, I recommend reading a few other recipes before trying this one. There apparently is a technique to rolling and chilling the dough that could make or break your pastry. Most of the recipes I read have the dough chilled in between rolling, so where it is noted “roll out three times” you will need to refrigerate in between for about 20 minutes. Put into a basin 7 oz flour, add to it 4 oz butter broken in pieces the size of a filbert. Add a squeeze of lemon juice. Put your right hand into the basin, pour in enough cold water to mix to a stiff dough. Roll out three times. Put as little flour as possible into the paste and roll out evenly.